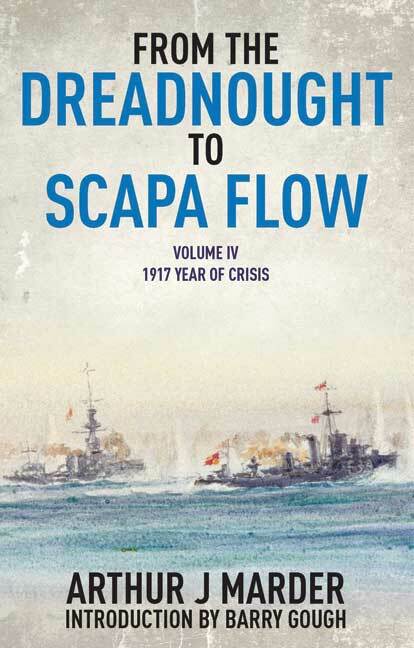 You'll be £16.99 closer to your next £10.00 credit when you purchase From the Dreadnought to Scapa Flow Volume IV. What's this? The fourth volume covers the period from Jellicoe's arrival at the Admiralty to deal with the U-boat menace until his dismissal a year later. Mounting losses brought about the introduction of the convoy system and the turn of the tide in anti-submarine warfare. The volume also looks at the beginnings of naval aviation. Volume Four, 1917: Year of Crisis addresses the change of Grand Fleet Commanders-in-Chief with Jellicoe departing to be First Sea Lord, relieved by Beatty. The latter’s strengths and weakness are discussed while Jellicoe wrestles with post-Jutland politics and the U-boat threat to which the convoy antidote was a hard fought policy decision. The genesis of naval aviation is also a feature of this volume. What Volume Four lacks in battle action narrative is compensated by the policy battles within the Admiralty and the British Government. The volume ends with the Jellicoe’s dismal removal from his post and the ructions this caused in navy, political and media circles. This is a valuable reference work that reads easily and will satisfy the most committed enthusiast of naval history.